This production marks the Broadway debut for the writing collaboration of Mark Schoenfeld and Barri McPherson. 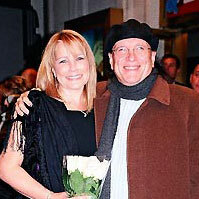 Mark first met Barri in 1982 upon hearing her sing at a cabaret and hired her to record some of his music. Shortly thereafter, Barri moved to Massachusetts to raise a family. Years later, in 1991, Barri returned to New York to perform at a private-party gig. She involuntarily stopped at a remote street corner in Brooklyn Heights after hearing the sound of a voice she vaguely recognized. She discovered that Mark had become a homeless street performer, getting by on $40 a day. Barri invited Mark back to Massachusetts to stay with her husband and two children. Mark repaid Barri by developing music with and for her and soon, the street poet and cabaret singer had the skeleton of a most unusual new musical.